Today was somewhat cold, but not nearly as bone-chillingly windy as yesterday. It ended up being relatively sunny, and with the wind lessened, it was possible for several of the students to get across the Churchill River by boat to sample the intertidal on the other side. This was the second trip out on the zodiac, the first being a few days ago while the ice was still around. The intertidal sampling was quite productive, but this means a late night of sorting specimens (while the advisor drinks tea and writes a blog). While the rest of the group was across the river, Joao and I collected at a few sites near the station. 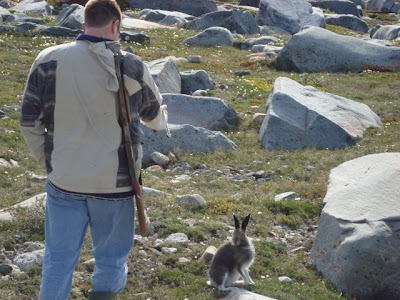 We came across a hare that did not seem too afraid of us. I suppose we’re not the most terrifying large mammals in the region. Speaking of which, there have been a couple of polar bear sightings, including by the field course participants and this one which was seen from the zodiac. It hasn’t been all hard work. 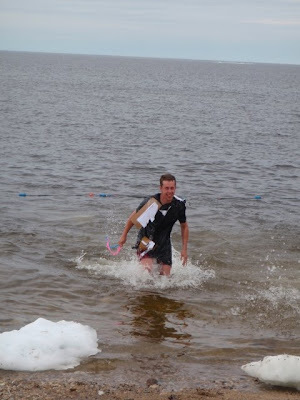 Nick decided to take part in the Bay Dip, which involves dressing up in a costume and swimming in the icy water. The rest of us were not so crazy brave. Tomorrow, more sampling, and I have a backlog of spiders to process. Click here for the Churchill fieldwork posts.